For some reason the passed few weeks I have been loving smokey, ultra blended out, brown eyes teamed with an outrageously bright lipstick. 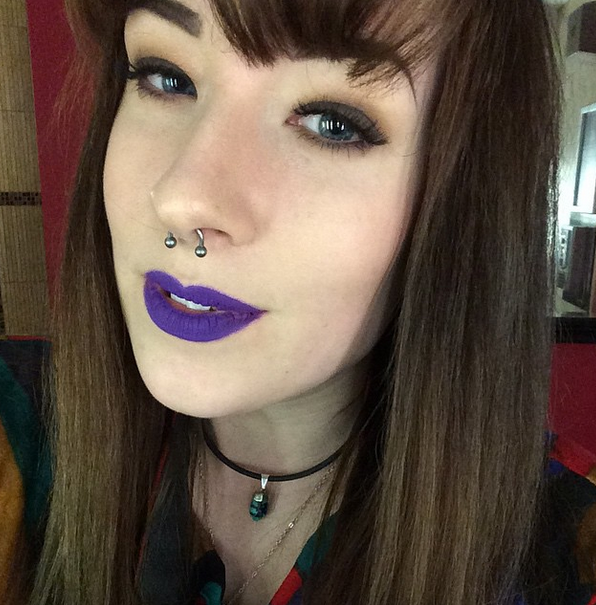 Since getting my fringe put in, I feel like I can pull off more lip colours for some bizarre reason. I was heading up to blog for Abstrakt, a alternative fashion event as part of Norwich Fashion Week, and decided to stick with my current makeup routine. I used a mixture of Mac and Sleek for the eyes. For the dark brown I used the darkest brown from the Mac Maleficent palette blended out with the creamy peach shade from the Sleek natural matte palette. I used the Browzing brow palette from Benefit in the darkest shade as usual for the brows, as it's my all time fave. I then applied I'm Royalty by Jeffree Star on the lips with a lip brush- one of my most loved shades at the moment! It stays on forever, and I don't have to worry about touch ups! So there's my easy makeup for NFW. If in doubt, a quick blended out brown eye and bold lip never goes a miss. Love that Effect of the Smokey Eye to you !! Just do it! ;) Might surprise you!